Like the other "Township made" Sjambok this is made by bare hand, using plastic sheets (polyethylene), which are heated and carefully rolled together. The pic shows the sjambok curled and secured, it uncoils itself like a spring if released. The taper runs smoothly down from 25 to 4 millimeters. 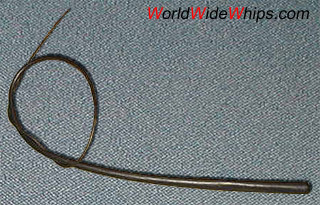 The whip makes a threatening sound when swung through the air, 5ft of pure sjambok power.